A sustainable development can be understood as social and economic development within ecological sustainability limits. 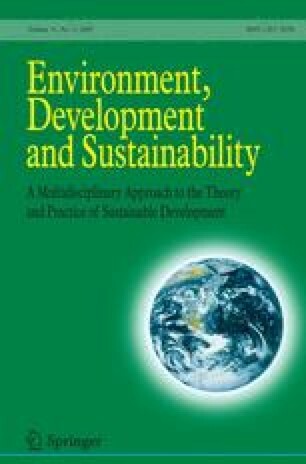 The operationalisation of a sustainable development presupposes integration of resource concepts covering relevant disciplines and systems levels. In this paper descriptive domains within physical resource theory (PRT), nutrition theory (NT), economic theory (ET) and emergy theory (EmT) are joined in what we call a “sustainability map.” The sustainability map represents a conceptual model of the economic production system in its ecological and social contexts. It is a contribution within the field integrated assessment. The relevance domain of each resource concept is analysed by comparison with the sustainability map. It is concluded that resource concepts that well supports a sustainable development should recognise the process restrictions that defines ecological, economic and social sustainability limits; thus recognise and in a relevant way treat threshold—and resilience phenomena; and capture the use-value of resources for human well-being. We suggest that the integration of NT, ET and EmT may contribute, while we find the value of PRT limited, as physics, thus PRT, is indifferent to life as a system characteristic, while life of microbes, plants, animals and humans is central in the sustainability context. The paper contributes to a theoretical foundation supporting a bridging of the implementation gap of a sustainable development, e.g. through its proposal of how to develop more accurate natural resource concepts. This study was performed with financial support from Ekhagastiftelsen, Nutek—the Swedish Agency for Economic and Regional Growth, The Nordic Council of Ministers, and the Swedish Environmental Protection Agency. OECD. (2001). Policies to enhance sustainable development. Meeting of the OECD Council at Ministerial level, 2001. Accessed March 29, 2008 from http://www.oecd.org/dataoecd/47/22/1869800.pdf. UN. (2008). Accessed February 25, 2008 from http://www.un.org/millenniumgoals/#.